Junior Isabelle Stadden walks the Blaine pool deck during a high school dual meet, offering encouragement while lending a helping hand to her former teammates. Stadden is determined to continue the bond she built up with them the previous four seasons. Stadden isn’t donning the school’s black suit or cap like in the past after deciding to continue training with her club team instead of competing at the high school level. She is one of three defending state champions in Class 2A who are forgoing this year’s high school season to swim for club teams. Another champion from Class 1A is doing the same. All four are focused on future endeavors, whether it be at the collegiate level or pursuing the Olympic dream. 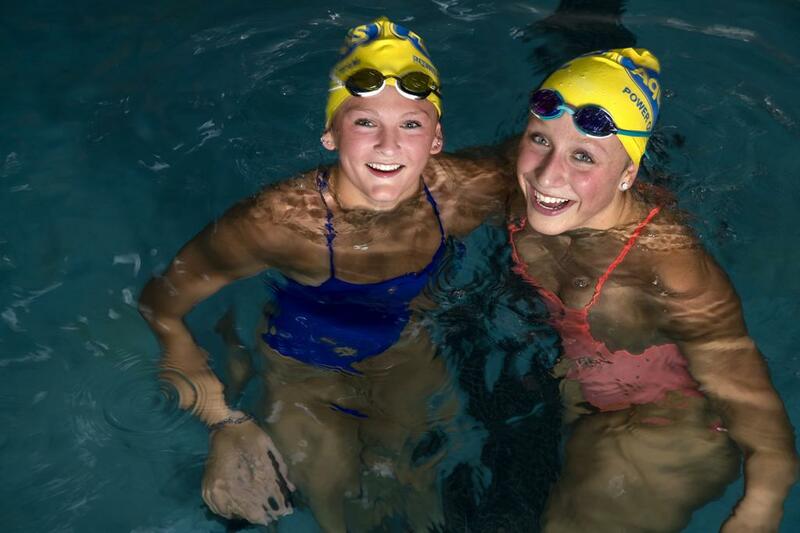 Stadden, Blake senior Madison Potter and Minnetonka sophomore Abigail Kapeller are with the Aquajets Swim Team. 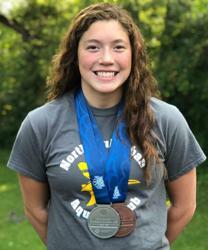 Roseville junior Pyper Doo is with the North Suburban Aquatic Club. “Student participants and their families make the decision to only swim with a club,” said Lisa Lissimore, high school league associate director who oversees swimming. High school league bylaws allow swimmers to compete with club teams during the prep season in events that don’t match high school events, i.e 200-yard backstroke compared to the 100 offered in high school. They also can train with and take private lessons from professionals and other non-school coaches, but can’t miss a high school practice or meet to do so. Swimmers can apply to the high school league to train, tryout or compete on a national team or in a U.S. Olympic development program if approved. The students must receive an invitation from the sport’s national governing body or the United States Olympic Committee. Stadden was named to the 2018-19 USA Swimming national team roster last month. Kapeller and Doo are members of the national select team. In choosing to focus on club swimming, the four defending champions did so for personal reasons.. The most common denominators were specialized training, higher intensity workouts and going head-to-head against the best in the country at national events. “I’m now training eight times a week. It’s a lot more intense,” Doo said. She and Kapeller will leave for the National Select team camp in the middle of this month at the Olympic Training Center in Colorado Springs. The Aquajets’ contingent enjoys an aspect they don’t get at the high school level: practicing and competing with boys at the same time. The Aquajets are known for their four core values: humility, accountability, perseverance and integrity. The latter one pushes each out of their comfort zone and to the edge of their ability. “It’s a really different type of training,” Stadden said. None have reaped the benefits more than Stadden. Her goal was to make the national junior team for 18-and-under, a step up from the national select team. She climbed a rung higher, to the national team. She will be competing in the U.S. Olympic team trials for the first time in Omaha, Neb., from June 21-28, 2020. The 2020 Olympic Games are in Tokyo. Stadden made the squad in the 200 backstroke, an event not offered in high school. She is a teammate of another Minnesota junior, Regan Smith of Lakeville. Aquajets coach Kate Lundsten knows just how difficult it is to take that final step. Kapeller, the youngest of the group, has been with her club the longest. She started in the Aquajets program at the age of 6. Kapeller’s younger sister, freshman Ellie, swims for the Skippers’ high school team. Ellie is a member of the Aquajets in the offseason. One aspect of the prep season that Kapeller said she will really miss is achieving goals set when the season begins. “I want to succeed when I’m swimming,” she said. Potter made what she called a “very difficult decision” when she elected to swim for the Aquajets this fall. 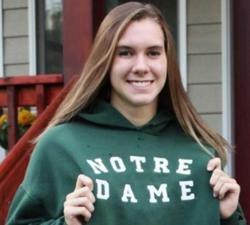 Less difficult was her choice for swimming in college — Notre Dame. The Irish finished last season ranked No. 19 in the nation. She plans to major in business, possibly in business science. Doo, the Raiders’ freestyle sprinter, took a few months — longer than her peers — before deciding right before the high school season got underway. Doo had been with Roseville’s varsity team since she was a sixth-grader. She is in her third season being coached by Rory Coplan with the North Suburban Aquatic Club. Lundsten and Blaine High School coach Kristen Luedtke have been on both sides of the club vs. high school swimming choice. Lundsten was the Eden Prairie High School coach for 10 years, winning four state championships, before switching to the Aquajets program in 2004. She has been a USA swimming coach for over 20 years. Luedtke, by contrast, started as a club coach before becoming the Bengals’ mentor. The three champions in Class 2A figured in five of the 12 swimming individual and relay state titles last year. Pyper Doo, Roseville, junior: 100-yard freestyle champion in 2017. Abigail Kapeller, Minnetonka, sophomore: (pictured top) 200 freestyle relay and 200 medley relay champion in 2017. Isabelle Stadden, Blaine, junior: 200 individual medley champion in 2016, 2017; 100 backstroke champion in 2017. Madison Potter, Blake, senior: 100 butterfly and 200 individual medley champion in 2016 and 2017.